I can't speak for Chris, but I think the whole idea is that we CAN'T have a growth model. We need a sustainability model. We need to stop growing. We need to figure out how prosperity can increase while growth is declining or steady. (Growth being resources used, population, etc). IMHO, I picture it being something where everything is designed and built to be reused and repaired to last forever. Clearly, manufactoring will not be a large part of that system. Agriculture will have increased importance. Everything that is consumed (fuel, food, water, toilet paper, etc) will all have to come from completely renewable sources. Another major part of this economy will be reclimation. Taking apart old and broken things to extract the valuable resources in them. Depending on how we get to this new economy, there may be a lot of scrap left over from our current economy. And, I hope that music, art and literature will be a part as well. They don't use up many resources (oral literature and music take up none) and are something that as a whole, our culture doesn't value much now. It would be intersting to hear what other people think the next economy will look like, after the dust (and hopefully not fall-out) settles. Growth is unsustainable. So, for example, sustainable growth is oxymoronic. A key point here: This isn't a philosophical or ideological position, but an inevitability of math and physics. You're right. Clearly we need to dispose of our disposable way of doing things. Products have lost quality my entire lifetime, so I don't even want new things anymore anyway. I'm a builder and a hiker. Everything from power tools to sleeping bags to boots were simply made better ten years ago. I think companies have caught on that people actually enjoy throwing things out that are barely used just so they can have the thrill of shopping for new ones. So, they must figure, why actually build something of quality that's designed to last twenty years. It's really just a waste of their time. Reclimation is also called salvage industrialism. This is a deadly vicious circle. Peak Oil and Gas and soon coal (actually should be called Peak Nett Energy) are right now putting an end to this nonsense. 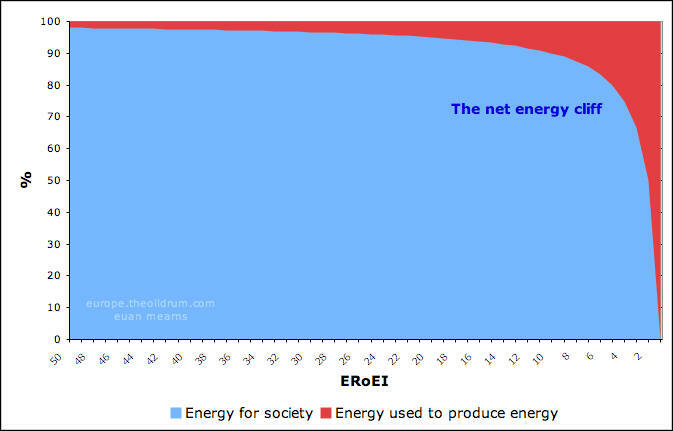 Growth cannot occur without growing energy sources. Period. Oil/Gas/Coal not only supply us with the enrgy to do work, they are also feedstocks for manufacturing metals and plastics, and they are critically important in our food chain. We have now hit limits to growth. Debts must all be cancelled. We need to learn to live within our means, and that means no cars and no planes, just for starters! IF we reduced our consumption of current fossil fuels DRAMATICALLY, and here I mean 80%+, we might be able to accomodate the production of some sustainable enegy systems....... but don't even think of using such systems to power un necessary transport. We have already squandered huge quantities of fossil fue;s on cars and flying, the last thing we want is to waste renewable energy doing the same thing all over again, only this time even faster. One only has to look at the natural world to see that growth is just one part of the birth, growth, reproduction, death, decay cycle. Living organisms all follow this cycle, and the decay products of one generation become the nutrients for another.What is true for plants and animals, is equally true for other closed systems. Our finite world with a finite net energy flux from the sun is an infinitely complex but closed system. As a consequence there must be a point at which growth of anything must stop, and when growth stops death will follow. The big problem is that manufacturing, finance, and advertising have all kidded themselves that growth never stops, and never goes negative, and have seen the human race as comsumers, rather than fellow members of a limited closed system. Boom and bust is just part of the natural cycle and the bigger the boom the bigger the bust! Being caught up in it all is just an unfortunate fact of life, and all we can do is to prepare ourselves as best we can for the rather uncertain and different future. As Chris says in the crash course what that means for each individual will be different and depends on our beliefs and what we think is most likely in our own future. I have no doubt that enterprising small businesses will rise out of the debris left by the crashes of some of our global businesses, but the future will not be the same as the past few years. Personally I have developed quite a number of practical skills (by training I have been employed in Broadcast Electronics most of my working life) and grow some of my own fruit and veg, cycle to and from work, and so feel I should be able to contribute well at a practical level to any local community as long as health and strength permits.I am concerned about what will happen as I get older and become more dependant on the help of others. My belief is that community groups will become much more important in the future, something that was a feature of my early post war childhood, but rapidly disappeared with rising consumerism, and individualism, encouraged in the UK by the "Thatcher Years" to the point now that hardly anyone knows their neighbour, and many do not even speak to them. So to get back to the topic, the only sustainable growth model is one where birth, growth,reproduction, death and decay are all part of the cycle. If we model business along these lines, then there have to be as many businesses collapsing, as new businesses starting, and the remnants of the old feed the new. This does happen to some extent already but it doesn't go down well with shareholders and governments. It can also be traumatic for those who find themselves out of work as I know from my own experience. However if it is recognised as being part of the cycle of life, and people are educated and prepared for it, and community and family relationships are encouraged, then together people can face these things and support one another. One final thought, my Grandfather was a carpenter and joiner and made furniture, a piece of which is still in my brother's house 80 years after he made it, and apart from a few surface marks pretty much as good as the day he made it. If all the furniture was made to that standard furniture factories would be out of business as soon as all households had the furniture they needed, until either a fire, woodworm, flood or some other cause rendered the item no longer useable. The cost of innovation, progress, fashion, has been the very "disposable" emphasis by manufacturers to ensure that they continue in business with next years model, all fuelled by cheap energy. Sustainablity means using energy wisely to create things that last and are repairable, and only replacing them as a last resort. Not the kind of model most businesses want to follow, but may be forced on them as energy comes at premium prices.